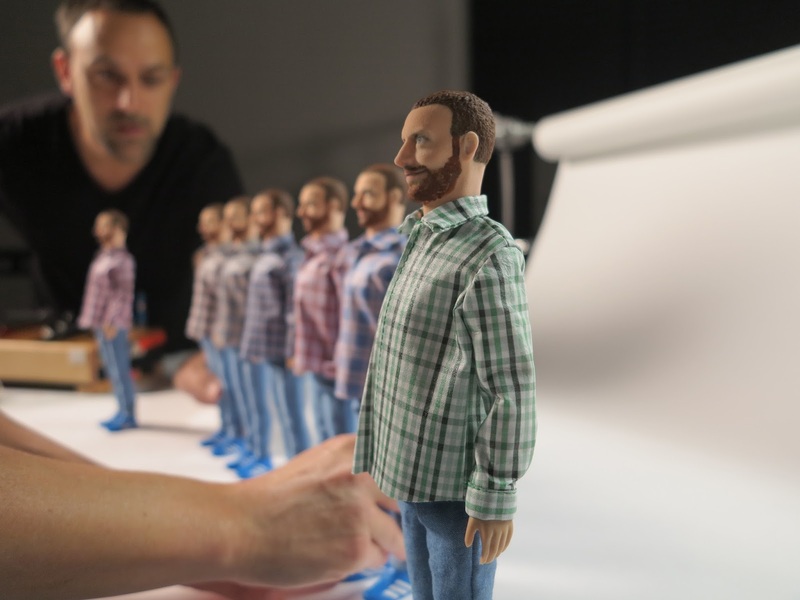 Grown men, playing with their dolls. 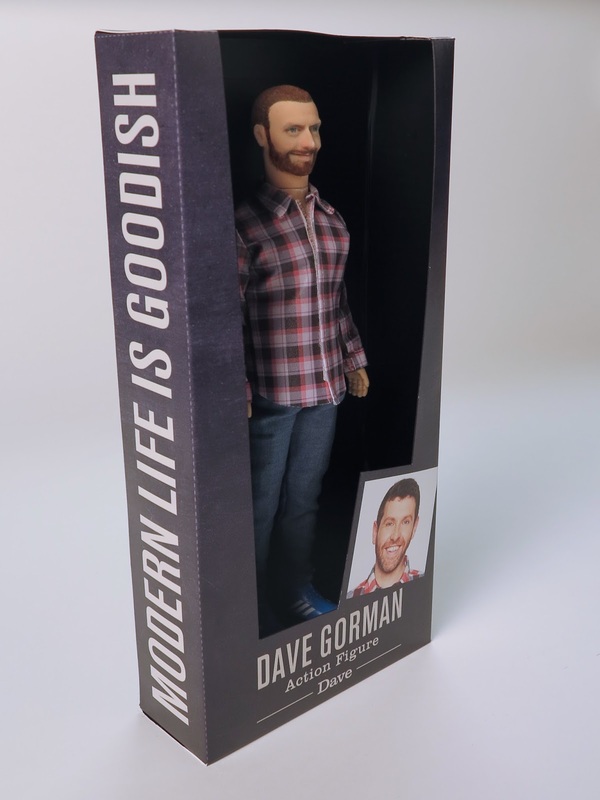 I haven't actually seen one of the ads go out as yet - but I can always tell when one's been on the telly because I get a small flurry of tweets from people telling me they actually want one of the dolls. Some people seem genuinely disappointed that they're not available. But they're not. You can't get one. Even I can't get one. When I respond to say as much, some people seem convinced that this is some kind of cunning double bluff and that we'll make them available as an ironic, nonsense bit of merchandise at some point. We won't. We really won't. For what it's worth I've always found the idea of merchandise a bit weird for a comic. Maybe weird's not right. Uncomfortable? I've never been comfortable with the idea of selling myself as a product. I tell stories for a living. I'll cheerfully sell you tickets, books and DVDs and so on because those are all just different ways of delivering what I do. 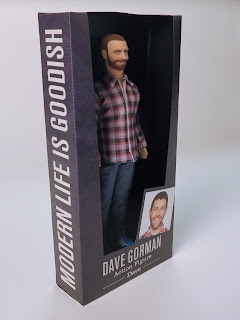 T-shirts, key-rings and, heaven help us, dolls are something else. I know plenty of people who do sell that kind of merchandise - some of them, friends, many of them comics I admire. And people have tried to persuade me to join their ranks because it could/would make touring a more lucrative enterprise. But there's always been something making me resist the idea. The way I see it: I don't think I'd be comfortable standing next to someone in a pub if they had my face on their t-shirt. So it would be a bit weird of me to sell them that t-shirt? I don't know. I don't think there's any great moral argument being made here... it's just not something I'm very comfortable with. Not available, not even in bad shops. That doesn't mean that on the day of the shoot I wasn't quite keen on getting hold of one of them when we'd finished. But it wasn't allowed. Presumably, because they needed them all for some post-production reason. I'm probably not the best judge as to whether or not they look like me or not but I'm not very convinced. On the day I spent some time trying to work it out. 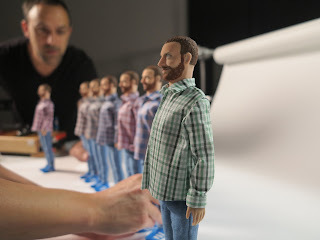 I'd hold one in my hands and look at it from all angles and as I turned it slowly between my fingers, there'd always be one moment - just one, precise angle - where it seemed to resemble me... but then a millimeter more rotation and it would look nothing like me again. I wanted to get one because I wanted to send it to my Mum. Anonymously. She didn't know anything about the trail and there would have been ample opportunity to have one dropped off at her house before any of the ads had been shown on the box. Imagine coming home to find a doll designed to look like your son waiting for you without any context to explain its existence? Oh well. Too late now. I don't know what's happened to them since the shoot. I dread to think. The heads and the clothes were obviously all made for the job. 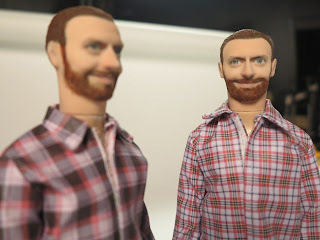 (Whoever painted the heads very flatteringly left all the grey out of my beard - which I'm very grateful for.) 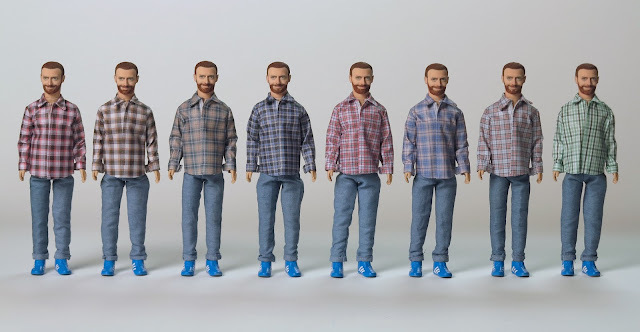 But the bodies were all from existing dolls. I have the body of a One Direction singer, apparently. 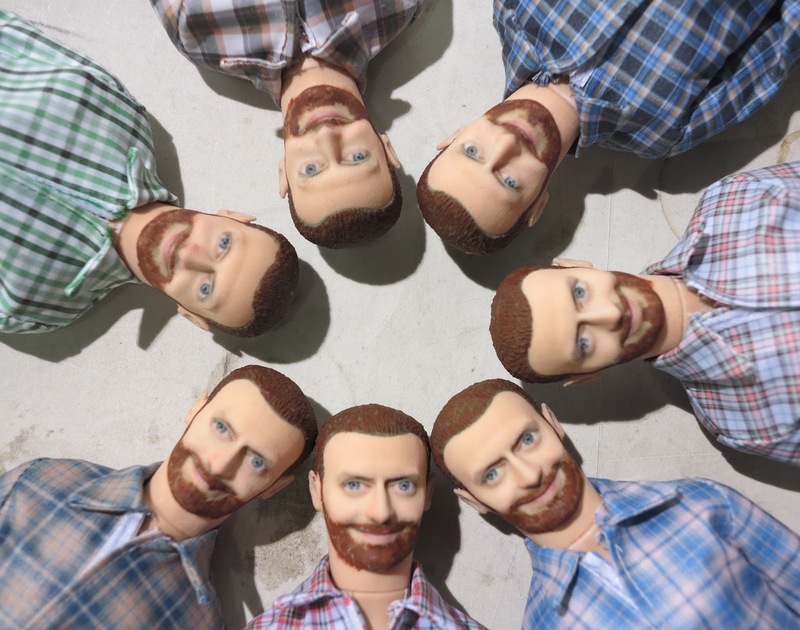 I think they were all Nialls. Or maybe they were Liams. 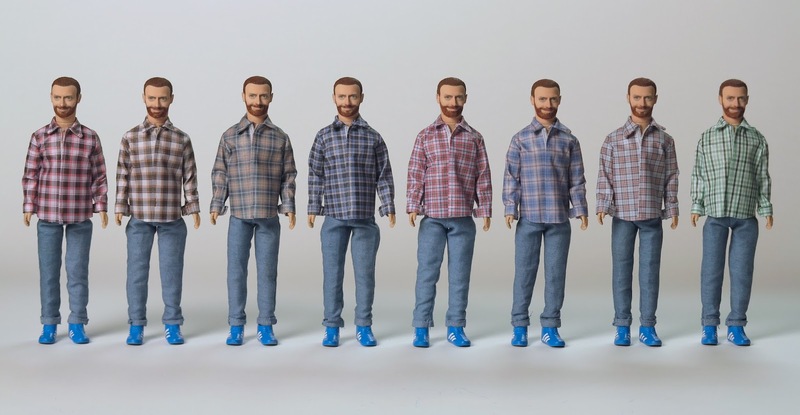 They had to all be the same one because the neck size varies from doll to doll otherwise. So pity the poor props buyer who had to go to a toy shop and buy eight Niall dolls. 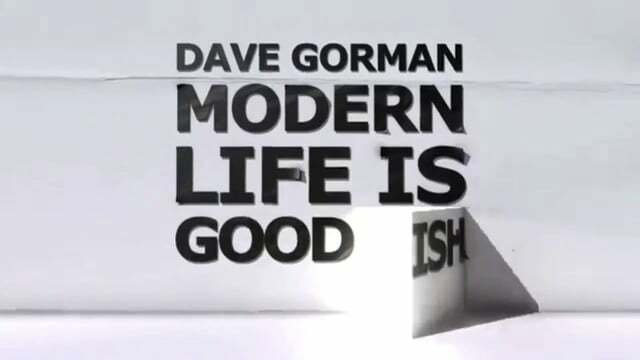 Series Three of Modern Life Is Goodish is now in the schedules. It starts on Tuesday, September 8th at 10pm and will be there every Tuesday for 8 weeks. 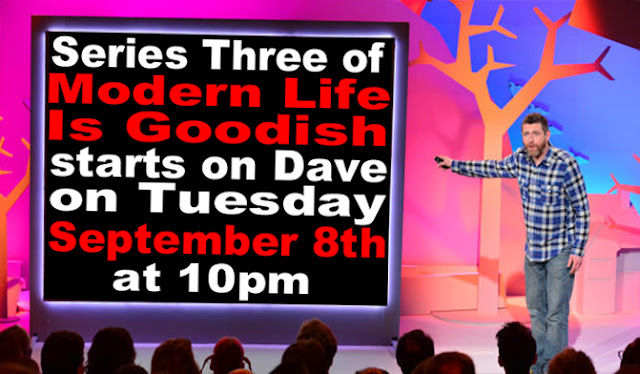 Since we finished making series 3 of Modern Life Is Goodish recently I've had a lot of people asking me when it's going to be on. I don't know yet although it seems likely that, as with series 1 & 2, it will launch in September. I won't be shy of letting you know for sure as and when it gets a confirmed date. What I wasn't expecting to find out at this stage - but I'm absolutely bloody delighted about - is that the channel already know they want more of it. They've commissioned series 4 and 5. Blimey. Just another 16 hours of stand-up, then. Apparently, UKTV estimate that the second series reached 7.8 million people... and the biggest audience was 102% up on the slot average. If you watched any of series one and two - thanks. I hope you'll enjoy series three too. And then four and five. When we make them. PS: This is the corporate announcement which contains more numbers I don't really understand. 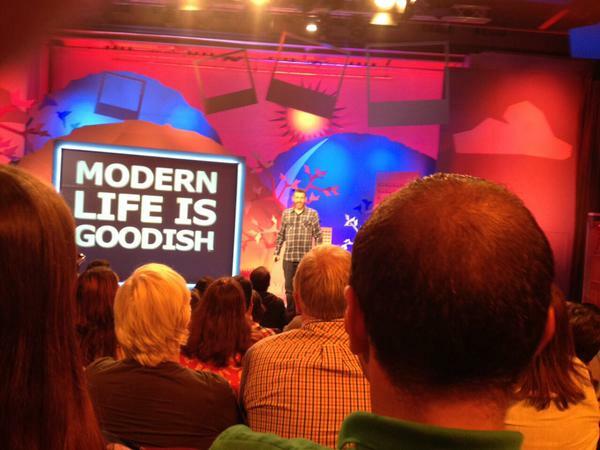 We finished filming Series 3 of Modern Life Is Goodish last week. Blimey. That was an intense few months. There isn't an easy way of making eight hour long shows. Making the powerpoint files - I reckon there are around 3,000 slides in a series - is always going to be time consuming. In the last couple of months there have been a fair few days where I've started work at 10 in the morning and not finished work until 3 or 4 the next day... and then only to get some kip as I lie in the passenger seat of a car as we head out to a small theatre for a dry run. But there's no getting away from the fact that making the shows work live first is the best way of making them work on TV. And putting several hundred slides together - and trying to do it well - just takes a long time. I wish I could see a shortcut through it - but there isn't one I can see that doesn't chip away at the end result in some small way. I wanted to let the dust settle a bit before I talked about something that I've had a lot of comments on: the ticketing for the series. It seems that this series, more people have been turned away and a lot of people have been sending me messages full of anger and outrage at the fact that the show has been - according to them - massively oversubscribed. I don't think that's a completely fair reflection on what's happened. I'll try and explain. They issued the same number of tickets for all the shows this year as they did for all of the shows last year. This year, the most we turned away was around 80 or 90 people. But on one occasion it was only 30ish. That's still more than I'd like to see turned away. But then, last year, issuing the same number of tickets meant that on one of our four recordings (we do two shows in a night) we didn't turn anyone away and we could have squeezed a handful of extra people in. The factor that varies so much is not the number of tickets issued. It's the number of people who turn up. For reasons that I don't quite understand, tickets for recordings are free. They always have been. I imagine they always will be. I like the idea in principle - after all, there's an income involved in the making of the TV show that has nothing to do with any ticket revenue. But it also creates a problem. If you get a free ticket to something and then decide that you can't be bothered on the day... well, so what? If there's football on the TV? Or your babysitter cancels? Or you find yourself in a sunny beer garden and your mate's just got a round in? Or you weigh up the idea that you might not get in anyway and so decide not to spend the money on a train fare? There are no consequences. So people ask for tickets... only to then not use them all the time. And this happens to pretty much every TV show that has a live audience. I know of one show - a big rating, popular show that has an audience of around 400 people. It regularly issues in excess of 3000 tickets. It rarely has to turn away more than 20 people and sometimes isn't full. That's a hell of a lot of people taking tickets and then not using them. And nobody knows until the day who is and who isn't going to come along. I suppose they could try issuing 2500 tickets for their show. But what if the 500 tickets they didn't issue were the ones that would have gone to the 500 people who would have turned up... and they ended up only issuing tickets to the 2500 who don't bother? On Modern Life Is Goodish the audience - there are around 200 of them - are in between the cameras and me. If we end up being 50 people down it will affect all of the shots. Having a full house is essential. How would you solve this mathematical conundrum? The one thing that I know would solve it - selling the tickets - isn't allowed. It has to be based on guesswork and previous attendance rates. Which is what it is based on. Sometimes there's no excess. Sometimes there's a relatively large excess. That's down to the randomness of human behaviour and has nothing to do with those issuing the tickets. I wish every one who requested tickets would just turn up. But over time, I've come to accept that this just isn't the case. Sometimes 30% of people show. Sometimes it's 80%. Most of the time it's somewhere in between. 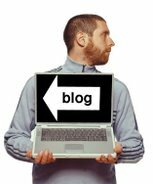 Many years ago, when I made my first TV series - The Dave Gorman Collection - a decision was made to not over-subscribe the tickets for the first recording. We were in a tiny studio that could accommodate just 100 people. My mailing list at the time was tiny. So small that I could remember many of the email addresses. Because the gigs I was doing were in smaller venues I also knew a lot of their faces. Everyone felt so certain that because all the people asking for tickets were from that mailing list, they would all come and it would end up being rude to massively oversubscribe. So we issued 110 tickets for the first recording. 50 people turned up. The other seats were eventually occupied by people who had been turned away from an oversubscribed recording of Goodness, Gracious Me. They didn't seem thrilled by the idea of watching someone they'd never heard of, doing something a bit weird rather than a series of sketches by the people they'd been excited about when they left the house that evening. It's the 60 people who didn't turn up that night who are the problem. It would be so much better if we could issue 200 tickets for these recordings and do so in the confidence that they'd all show up. But we can't. Because they simply don't. But at every recording this series - significantly more people got in than didn't. In fact, the number of people turned away is not only smaller than the number of people getting in... it's also smaller than the number of people who are requesting tickets but not showing up. Which illustrates how unpredictable people are. It's an imperfect system. But when 280 people turn up. That's not because the ticketing people issued 80 tickets too many. On another night, they could issue 80 tickets less and end up with a theatre with only 120 people in it. There isn't a way of knowing who will and who won't show in advance. If there was - we'd issue 200 tickets to the right people. 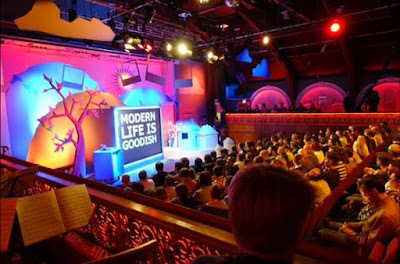 Oddly, one of the people who sent a very angry email about not getting in to one of the Series 3 recordings did have tickets for one of the shows in Series 2 also. But they didn't turn up that time. In their head, we were supposed to issue two more tickets for the series 2 recording because we should have predicted they weren't coming... but issue two less tickets for the series 3 recording because we should have predicted they were. None of us likes to see people turned away. But insisting that we should have known how many people would show up and therefore could have done something about it in advance just doesn't add up. One thing we do do is ensure that anyone turned away on the day is offered a guaranteed seat at a future recording. But do you know what - some of the people who request that, then don't show up for that... and so the prediction game remains as difficult as it ever was.